High and wild—that is how the cannabis plant has grown in India. But, its uses have not been restricted to those two words. Though many farmers in the upper Himalayan reaches have grown the weed for its recreational use, women of Shauka and Kuthalia Bora tribes in Uttarakhand’s Kumaon, Pithoragarh and Almora districts have been planting cannabis for its fibre and medicinal properties. Today, women in the state are cultivating cannabis as part of Uttarakhand’s industrial hemp cultivation promotion policy. 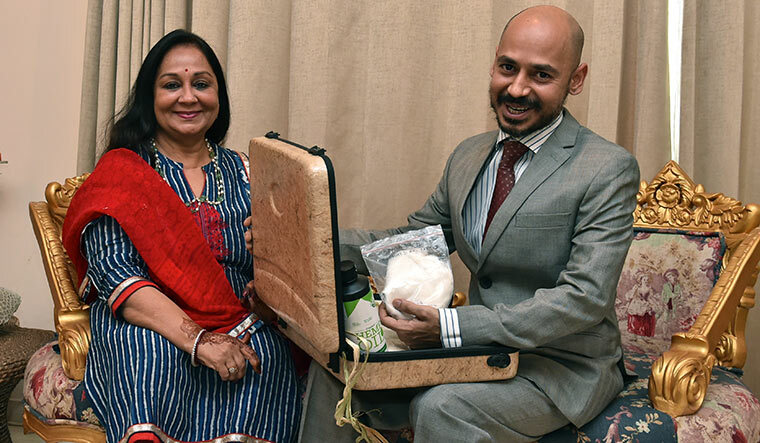 Bengaluru-based Viki Vaurora (above) provides hemp seed oil to cancer patients. He learnt to make cannabis oil from Rick Simpson, Canada-based cancer survivor and a global figure in hemp legalisation. Uttarakhand was among the first states in India to formulate an industrial hemp policy, which has empowered scores of women self-help groups (SHGs) and opened up several research possibilities. Take, for instance, the Mandakini Women Weavers based in Garhwal. Women here produce hemp yarn; the fabric feels like linen, and is said to be non-allergic. It reportedly keeps one warm in winter and cool in summer, and also deflects harmful ultraviolet rays. Likewise, 75 families in Uttarkashi, Rudraprayag, Tehri Garhwal and Dehradun are engaged in making textile out of hemp. With corporate aid, women from SHGs are learning to prepare raw materials, which can help make food items, textile products, building materials, paper, fuel, motor and aviation components and medicines for ailments like cancer, epilepsy and AIDS. Some of these SHGs have a turnover of Rs 10 lakh to Rs 18 lakh—nearly three times the Rs 3 lakh loan they received from the government. The Union textile ministry already has an official hemp fibre policy, with an estimated annual export market of Rs 2,400 crore. Recent researches in material science, health and nutrition, too, have described cannabis or marijuana as the new frontier for several new technologies. Though cannabis is called the poor man’s drug today, it finds mention in the Vedas and ancient ayurvedic texts as a medicinal plant. There are generally two varieties of cannabis—Indica and Sativa. The Indica strain has higher amounts of the intoxication-inducing THC (tetrahydrocannabinol), which has always been the ‘worry point’ for authorities. Whereas the Sativa variant contains more of CBD (cannabidiol), which has medicinal properties. Also, its cellulose fibre composition—important for producing hard, durable, light and biodegradable bodies for automobiles and aircrafts—is higher. Thanks to the several possibilities, corporate firms, too, are carrying out research on cannabis and its uses. Baba Ramdev’s Patanjali, headquartered in Haridwar, is planning to launch cannabis-based ayurvedic aids for pain and diabetes in the near future. Bombay Hemp Company (BOHECO), a startup founded by seven young minds, raised a seed round of Rs 6.25 crore from a group of investors including Ratan Tata, chairman emeritus of Tata Sons, and Rajan Anandan, former Google India managing director. It is set to receive another Rs 50 crore from new foreign investors. BOHECO is successfully exploiting the possibilities of a budding hemp economy in India. It markets a number of cannabis-based products, including hemp linen shirts, fabrics, T-shirts, briefcases, hemp seeds, oils, proteins, body creams, lip balms, soap bars, hand butters, swatch books and badges. The company was central in formulating Uttarakhand’s hemp policy, and is working with other states, such as Madhya Pradesh, Kerala, Gujarat, Karnataka and Maharashtra, to legalise commercial cultivation of marijuana. “The idea came to us after all of us worked in the rural sector and found this hidden resource right in front of our eyes,” says Jahan Peston Jamas, cofounder, BOHECO. “There was also a lot of untapped knowledge and local intelligence on usage of hemp.” In Australia, he says, he saw hemp being used to make surfboards, as building material, and hemp seed being used as protein food. BOHECO is researching the medicinal uses of cannabis in collaboration with the Council of Scientific and Industrial Research (CSIR), and is working on other projects with IIT-Delhi and the textiles ministry. Cofounder Sanvar Oberoi, a Phd and researcher in agronomics, hopes the research would yield a significant change in the current business landscape for hemp and hemp-related products. Gurugram-based entrepreneur and yoga instructor Shantanu Mishra, 29, came across the myriad uses of cannabis during his stay in Europe. He formed the Indian Hemp Association (IHA) with his mother, Padma, in 2016. Mishra, too, was part of the committee that formulated Uttarakhand’s hemp policy. The IHA makes representations to various state governments, law enforcement agencies and Union ministries to clear the misconceptions surrounding cannabis and to educate them about its commercial benefits. 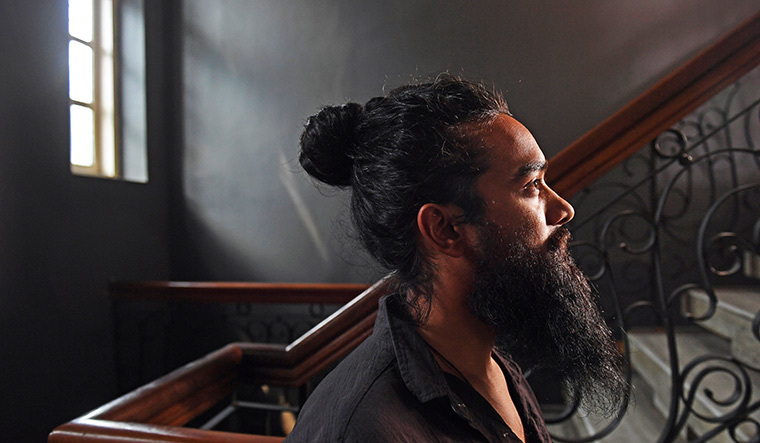 “There are a lot of people who want to come to India and research hemp,” he says. India, says Mishra, needs to prioritise on researching the benefits of cannabis. He cites the example of China, which grows cannabis on over 70,000 hectares and has a dedicated cannabis research university. Thailand, too, has legalised cannabis cultivation and the use of medical marijuana. Mishra hopes to meet Prime Minister Narendra Modi and gift him a briefcase made of hemp fibre. “With his help, we can not only double, but triple farmers’ income by 2022,” he says. Mishra’s mother, Padma, says children should be told about the benefits of cannabis, instead of shunning it as a drug. “We have lived abroad and seen that this openness is actually a positive thing for the society and for the younger generation,” says Padma. The politics over cannabis started in the mid-1950s in the United States. In 1961, India signed the United Nations Office on Drugs and Crime (UNODC) treaty—Single Convention on Narcotic Drugs—which clubbed cannabis with other hard drugs. The treaty criminalised cannabis and restricted research on its other properties. Indian lawmakers, however, used a clever ploy to ensure that cannabis could still be explored in the future for its other uses. 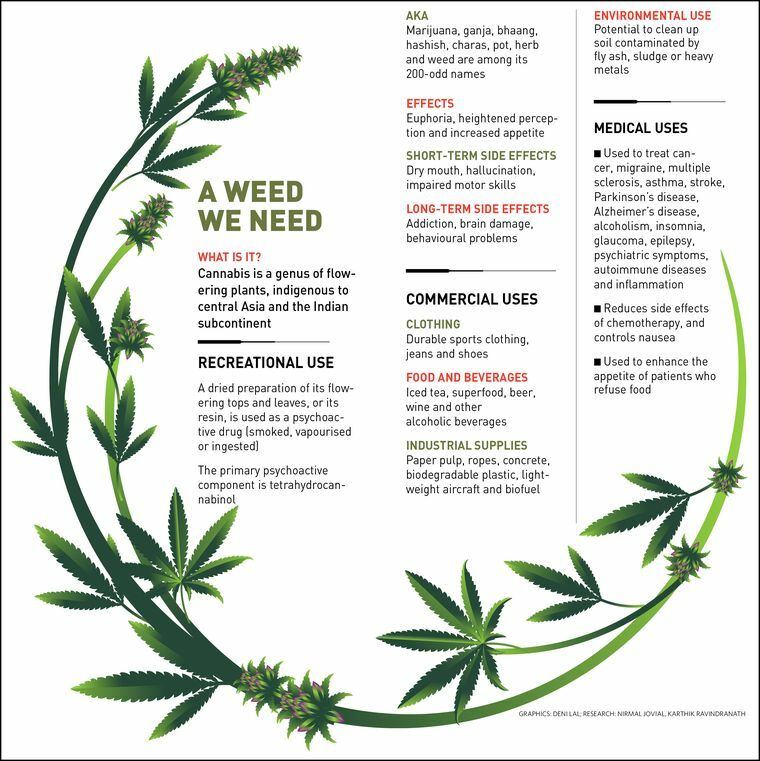 “While section 8 of Narcotic Drugs and Psychotropic Substances (NDPS) Act, 1985, prohibits cultivation of cannabis for recreation, section 14 allows state governments to grow it for generating fibre and seeds and exploring other uses of cannabis,” says K.V. Dhananjay, Bengaluru-based Supreme Court advocate, who is readying a petition to decriminalise cannabis. Despite its benefits and part acceptance, cannabis is still stuck in a legal tangle, given the complexity of governance by both the Centre and states on its cultivation, sale and consumption. “Hemp licencing is not under our control, only enforcement is,” says S.K. Jha, deputy director general (operations) at Narcotics Control Bureau (NCB) headquarters. The NCB has detected illegal cannabis cultivations in states like Odisha, Uttarakhand, Himachal Pradesh and Jammu and Kashmir. The NCB even uses satellite imagery to detect illegal plantations, and uses the state police force and its own teams to burn them. Last year, the NCB is learnt to have detected and destroyed over 40 hectares of cannabis plantations across India. Under the NDPS Act, possession of cannabis, ganja and hashish is a punishable offence. Punishments vary from one to ten years, depending on the quantity found in possession—small (up to 1kg), intermediate (up to 5kg) and commercial (10kg or more). Though death penalty for repeat offenders of cannabis cultivation or commercial quantity possession was relaxed after the May 2014 amendment, it made smaller offences more serious in nature. “Earlier, the minimum punishment for cannabis possession was six months. After the 2014 amendment, it has been extended to one year,” says Jha. But, lawmakers are actively seeking legalisation of cannabis in a number of states. “Decriminalisation of cannabis is the need of the hour,” says Biju Janata Dal’s Lok Sabha MP Tathagata Satpathy, who has sought to de-list cannabis from the NDPS Act. “The plant requires very little care and water, and it can grow unattended. With its high commercial value, it should be the ideal cash crop.” He once even wore a kurta made of hemp fibre to Parliament to educate his colleagues. Also, actor-MP Vinod Khanna, who died of cancer, is said to have used hemp oil to relieve the pain and side-effects of chemotherapy. Vaurora posted Leela’s case study on Facebook, and within days started getting enquiries from patients from all over the country. He would initially pick only the most critical patients, and make the oil in his make-shift laboratory in Bengaluru. One syringe would cost him Rs 10,000—Rs 15,000. “But, we never asked for money,” he says, giving patients the option to donate for future treatments. Vaurora claims to have cured at least 1,500 cancer patients across the country. He procures the raw material (correct breed of cannabis) from growers in the deep jungles of Karnataka and Tamil Nadu. Today, Vaurora leads the Great Legalisation Movement. Jammu-based Indian Institute of Integrative Medicine (IIIM), which is part of the CSIR, has been lucky—it obtained commercial licence from the state government to grow cannabis at its research station. In 2015, it started researching the medicinal usage of cannabis. Ram Vishwakarma, director, CSIR-IIIM, says they have started pre-clinical (non-human test subjects) and clinical trials for cannabis-derived medicines. For its clinical trial, CSIR-IIIM is in touch with all reputed cancer hospitals in the country to test the drugs on terminal patients. “We expect to have results for regulatory approvals in a year or two before we can release our research for commercial exploitation,” says Vishwakarma.